Thermostats | Quality Heating, Inc.
Quality Heating offers a wide selection of thermostats designed to meet your individual needs. Whether it’s a wi-fi enabled thermostat or a touch screen control, you can rely on Quality Heating to provide you with the solution for your home’s unique comfort needs. 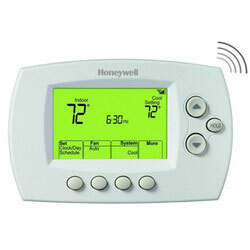 Honeywell’s FocusPRO 6000 digital thermostat offers the perfect blend of features, performance, energy savings and value. With the largest back-lit screen in its class, the FocusPRO 6000 prominently displays both room and set temperature. Based on dozens of customer reviews, it holds an almost perfect score out of 5.0 stars, and it is the most-reviewed product on the whole site. Customers describe it as “easy to program and simple to use” since it is virtually effortless to set and adjust temperatures with this device. This touchscreen, 7-day programmable thermostat has auto changeover, a 5-year warranty, and can include optional indoor and outdoor sensors. 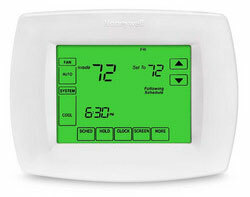 If you want your home to feel comfortable for years to come, this VisionPRO thermostat is the best option.